Gratitude: A Prayer and Praise Coloring Journal is part of the Living Expressions Collection by Tyndale Publishers. The introduction invites you to “connect with God in a fresh, new way” through creative expression (drawing, coloring, journaling, etc.) that supplements prayer and meditation on Scripture. The journal's cover is eye-catching and the inside pages are tastefully illustrated. Each entry is two pages long and most coordinate a prayer, a Scripture, illustrations to color, and a lined space for writing thoughts and prayers. The lined space is limited and easily filled up, but there is usually blank space that can be used for overflow. Lest the journal be too uniform, the topics vary and sometimes there is simply blank space instead of lined space or a Scripture thought with no pre-written prayer. While coloring and journaling comprise most of the encouraged artistic activities, some suggest making a collage or drawing. It's challenging: The prayers often express thankfulness and then ask God for personal growth (which we all know can be difficult). It's flexible: On days that you have plenty of time, there are pages with space for a lot of intricate coloring. For busy days, there are some that don't require coloring or very little coloring. The pages and thoughts don't compile, so you can skip around as needed. 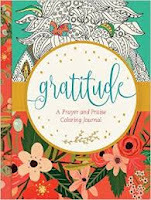 Gratitude: A Prayer and Praise Coloring Journal would make a lovely gift for a woman of any age.